self into a white mile-stone; only I pray you be very care­ful. The king and queen of the town will come out to meet you, leading a little child with them. Whatever you do, don't kiss the child, or you will forget me and all that has happened to us. I will wait for you here foi three days." not taken Hyacinthia's advice. The king and queen came out to meet him as she had said, leading with them a lovely fair-haired little girl, whose eyes shone like two clear stars. 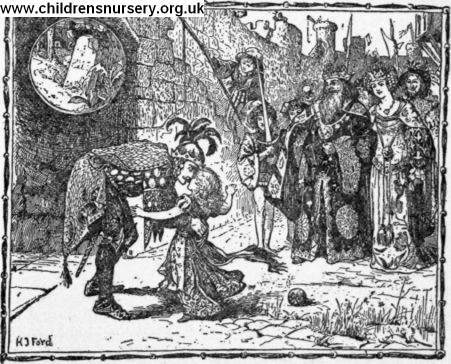 The child at once caressed the prince, who, carried away by its beauty, bent down and kissed it on the cheek. From that moment his memory became a blank and he forgot all about the beautiful Hyacinthia.